I see a lot of Bass players of all levels who struggle with their instrument. Even those with otherwise impressive skills can get lost in the upper registers, struggling to find the desired notes. This is often because they don’t know the fretboard as well as they should – or could, with some dedicated practice. Thoroughly learning the fretboard is what this lesson is about. When you are playing, the instrument should be removed as much as possible from thought, allowing you to play music. This is something Victor Wooten explained to me early in our friendship, and I agree 100%. When you don’t have to think about where you are, what notes are available, and where those notes are located, it frees you to just play music. Just to be clear I’m not talking about pattern playing. When you rely too heavily on preset patterns, you stop being a musician and start being a technician. I’m talking about knowing – really knowing – every note in every position on the neck, and knowing them so well that you can access them without any thought about the finger mechanics involved or your instrument, leaving you to focus playing Music. In this lesson I’d like to share a few exercises I feel are helpful in learning your fingerboard. 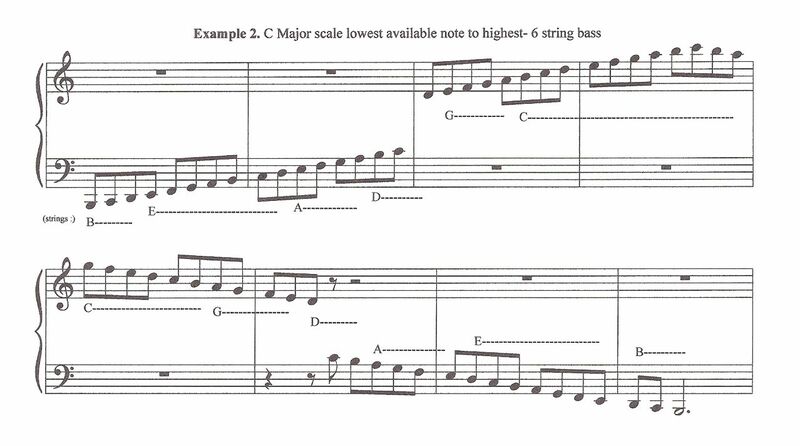 In order to remove learning a new scale from this lesson, we’ll use the C Major scale as the example, because we should all have that one down pat. 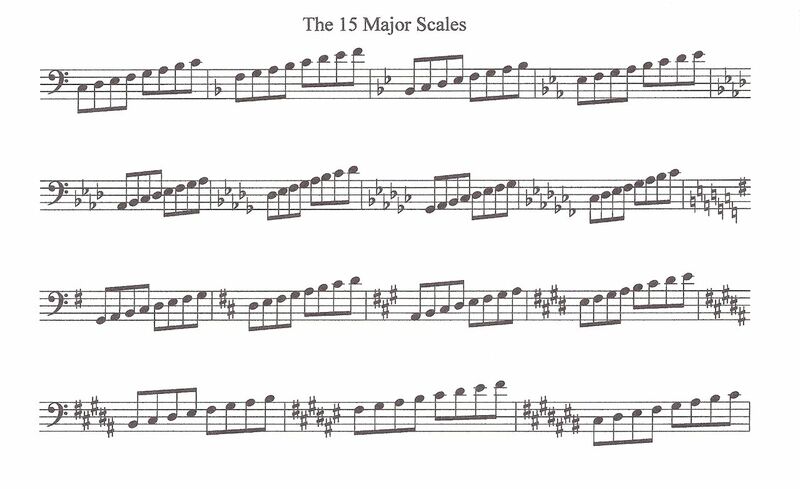 Remember, though, these exercise can be used with any scale, in any key – and you should use them with every scale you know, and any new ones you learn. Even if you’ve been playing a while, I suggest you learn each exercise at a slow tempo, striving for accuracy before speed. [See the Accuracy First video. – ed.] Once you can play an exercise comfortably at a slow speed, you can then increase the tempo gradually. I feel we teach ourselves/learn better by playing slowly at first. I also find using a metronome set to a low tempo to be helpful. One of the best ways to really ingrain the sound of a given scale is to sing it before you play it first and then while playing them on your bass. This also helps with ear training. You don’t have to have a great voice. Remember to recite the letter and then the number underneath, which is the interval. NOTE: The dashes above indicate half-step intervals. All other intervals are whole steps. Play the triads and 7th chord arpeggios and their inversions. As simple as this sounds, I am surprised at how many bassists cannot do it fluently. All bassists should know how to play all triad forms: Major, Minor Augmented and Diminished. They should also know the 7th chord arpeggios and the inversions. I urge you, from this moment forward, to incorporating arpeggios into your scale exercises. Yes, modern music leans toward certain keys more than others. Even so, the high profile keys can change from one genre to the other. You may also find yourself in a situation in which you need to transpose to another key. So, make sure you are practicing all scales in every key. Exercise 1 – One string (and one finger) at a time. Remember to sing the scale or Arpeggio alone first, then with bass. Beginning with your lowest string, play every note of the C major scale, singing the note each one as you play it. Also recite the letter and then the interval. Use only your index finger (1) all the way up and down that string. Play the triad and 7th chord arpeggios and inversions, again with one finger. Then, move to the next string, and repeat the exercise. Continue through all strings on your bass. Repeat the entire process (including arpeggios and inversions) with the middle (2), ring (3) and pinky (4) fingers in order. Exercise 2 – Add a finger. Repeat Exercise 1, but this time using two fingers at a time: 1 and 2, 2 and 3, 3 and 4. Don’t forget the arpeggios. Exercise 3 – Add another finger. Continue the process by using three fingers at a time. Exercise 4 – Use them all. Finally, use all four fingers. You can expand on this exercise by exploring the various position shifts available to you by shifting after each individual finger. Exercise 5 – Learn the position. This time, beginning down at the lowest possible position, play the scale from lowest note to highest note available in that position, using all four fingers as needed. Do not change positions. And, yes, do the arpeggios and inversions. Make sure to practice all 15 Major scales in position too. Work your way up the neck and back down. Exercise 6 – Play it all. Now that you know every note, in every position, using any combination of fingers, it’s time to play the scale from lowest available note to the highest available note at the top of your neck, and then back down. (Of course, you should go up and down for all exercises.) For a 6 string bass, it would start with open Low B and go to high C on the 24th fret of the C string. That’s a 4-octave range. These groups of exercises will help you become intimately familiar with your fingerboard, for any scale you use, so use them with every scale you know. To help get you started, I’ve written out the major scale (1 octave) in all 15 keys. A great homework assignment is to work all the other scales you know, with these exercises. This really helps ingrain the scales into your memory. These exercises have helped me immensely. I hope you find them just as useful. Click on the following graphics to view in full size, and to save to your hard drive.